Crawl under the blankets with a glass of wine and settle in for another season of movies at the Entertainment Quarter in the Showring. 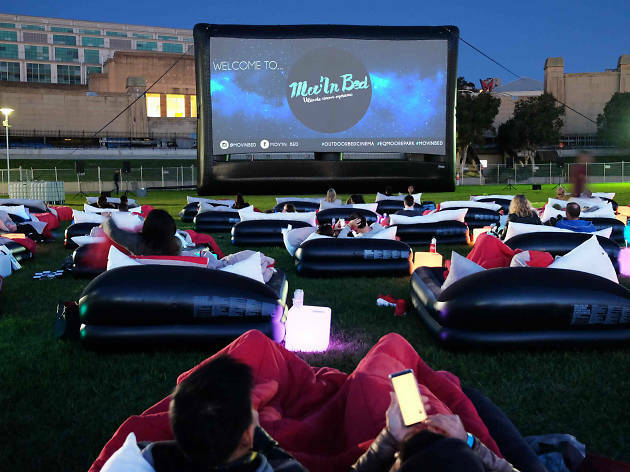 The concept is irresistible – a large inflatable bed to snuggle into, food, drinks and a great movie – but this year they're introducing a few innovations. 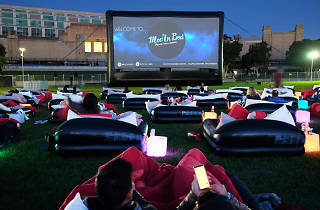 They include Bottomless Popcorn sessions – with unlimited refills from the Bar – and cheap Grass Tickets, where you can bring your blanket and a picnic and enjoy your favourite movie under the stars for as little as $9 per head. Then there's the option to Dine in Bed. Mov’in Bed is partnering with the Rockpool Dining Group – Fratelli Fresh and Bavarian Bier Café – to offer food delivered straight to your bed. You can even order your food in advance online. The Bar, meanwhile, will be serving beer, wine, bubbles, ice cream, candy and popcorn. The line-up of movies is a well curated as ever. Highlights include recent hits such as Fantastic Beasts: The Crimes of Grindelwald; Johnny English Strikes Again; Bohemian Rhapsody; Mamma Mia: Here We Go Again! and Mortal Engines. Also on the line-up are some of 2018’s best films such as Ocean’s 8, Black Panther, BlackKklansman and The Breaker Upperers. Retro greats screening at Mov'in Bed include The Jungle Book, Ted, Pulp Fiction, The Lion King, Pretty Woman, Akira and Notting Hill. Keep an eye out too for 2019 releases Aquaman, Ralph Breaks the Internet, Green Book, Glass and Mary Poppins Returns, all of which received positive reviews. Looking for the perfect gift? How about a Mov’In Bed gift card? Check the website for more details.